The dining room is understandably one of the most high traffic areas in your home as you will entertain guests and have your meals there so it should definitely be stylish and trendy. If you can’t be bothered to do a complete makeover for your dining room you can consider an easy upgrade by using wallpapers to spice it up. 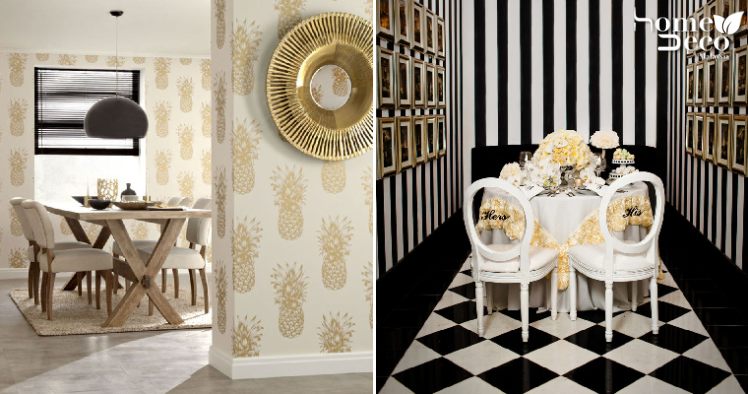 Having a simple and elegantly decorated dining room is fine but if you want to add a little quirkiness then try out this cute wallpaper that is covered in pineapples. The gold colour makes it look more classic and stylish so that it meshes well with your decor. Make a big impact in your dining room even if it is in black and white with this cool wallpaper that looks edgy and modern. It can brighten up your space without the need of using any colours. Go for a classy and timeless look with this crystal-looking wallpaper that has a unique pattern. The beautiful grey colour also goes well with any colour scheme. If you want to add a feminine touch to your dining room then floral wallpaper is a great way to do so. It adds a nice vintage touch to the room and makes it look really chic as well. For those people who like a simple and sophisticated touch in their dining room, this grid wallpaper is perfect as it makes the room look modern and clean. The neat lines complement the rest of the decor well for a stylish dining room.